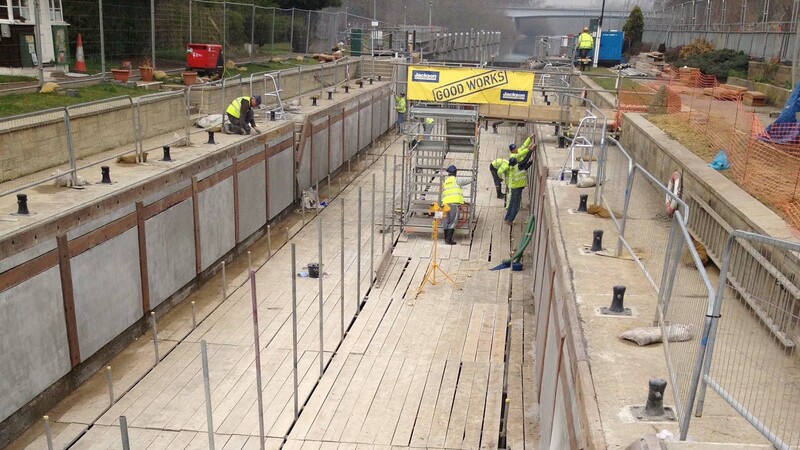 In the refurbishment of Chertsey Lock on the River Thames, Weber has supplied a significant quantity of high specification structural repair concrete. The busy lock, to the west of Walton-on-Thames and east of Staines, is popular amongst river users. Over the years, unavoidable wear and tear from boats and the river itself has caused deterioration of the lock chamber. 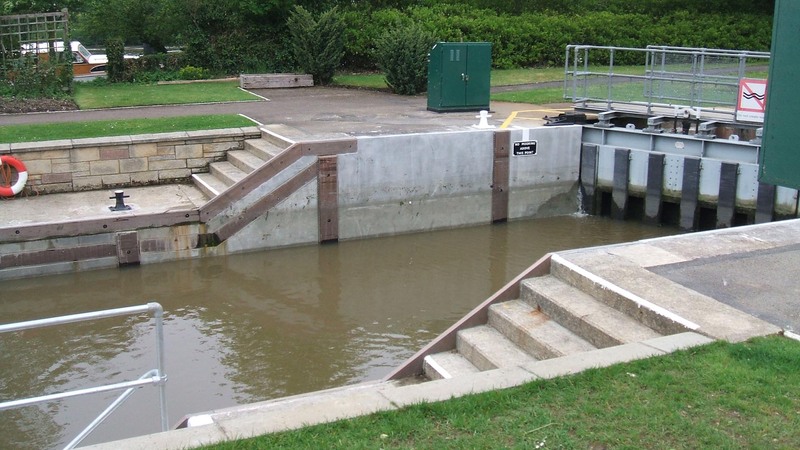 As part of the Environment Agency’s commitment in maintaining the River’s many structures, which amounts to more than 2,000 assets on the River Thames alone, work commenced in November 2011 to extend the life of the lock by at least 30 years and return it to its former glory. The main contractor was Jackson Civil Engineering of Ipswich, Suffolk. Over 1500 25kg bags of webercem spray DS, a polymer-modified, dry-spray, cement-based concrete, were required to complete the project. The lock was fully drained to gain access to the walls and applicators Currall Lewis & Martin (Construction) Limited of Oldbury, West Midlands, applied webercem spray DS by a process of ‘guniting’, a high pressure method of spraying concrete on to vertical and horizontal surfaces. 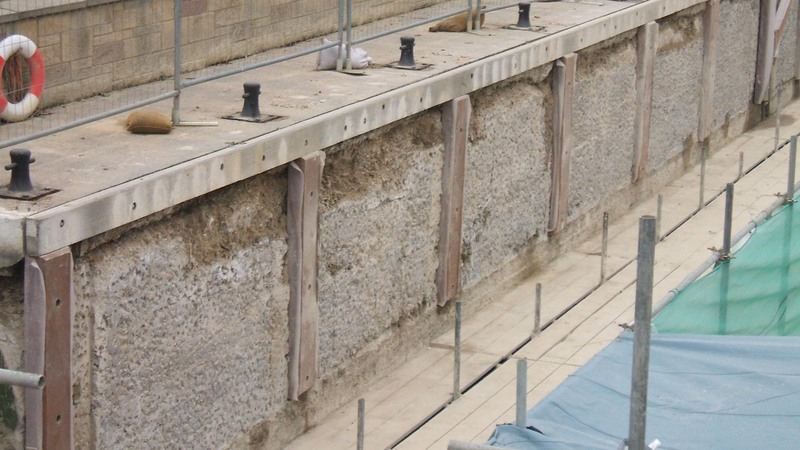 Initial works at Chertsey Lock involved the removal of the existing cement based lock wall at a depth of 75mm. This was carried out with hydrodemolition but discovery of a 50mm mesh reinforcement resulted in the need to change the method of removal. The Environment Agency permitted the walls to be saw cut and broken out by hand which allowed the programme of works to continue on schedule and negated the need to monitor the risk of water contamination. After removal of the concrete, resin injection works to 200 linear metres of cracked walls was carried out. New reinforcement mesh was fixed to the walls and batons to the bottom edge to terminate the concrete spraying works. “After power washing the walls to remove any loose debris we pre-dampened the area in preparation for spraying,” says Mike Fullerton, infrastructure manager, Currall Lewis & Martin (Construction) Limited. “We used webercem spray DS for the reinstatement work which achieves less rebound than any other dry spray system we have tried. We bulked out in one pass to a depth of 80mm to accommodate the new levels set by the timbers installed by Jackson Civil Engineering Limited.” The freshly sprayed walls were dragged back with a feather edge rule to level the material and lightly sprayed with water after the initial set of around one hour, to provide a good surface for the final pass of 30-40mm of webercem spray DS. A further process of levelling was required before sealing the surface to the specified finish. The work area was immediately installed with protective polythene sheeting and secured for 24 hours to prevent rapid dehydration of the cement from strong winds during the curing process. Spraying works to the quoin ends of the lock were also carried out requiring precision and accuracy. The formulation of webercem spray DS, which contains inert limestone aggregates and dust suppressants, has been especially designed for dry process spray application to give high early strength in 2-3 hours, reduced rebound and maximum application thickness. It achieves a compressive strength of up to 56.3 MPa in 28 days, tested to BS EN 12390-3:2002 at 20OC, and a flexural strength of 9.8 MPa, tested to BS 1881-118:1983. webercem spray DS is highly resistant to shrinkage and chloride penetration.